Hi All! I’ve got 3 (now 2! now only 1 left) costumes that need rotated out. All are gently used but have tons of sparkle and life left in them! First up, the Orange Dahab! SOLD! 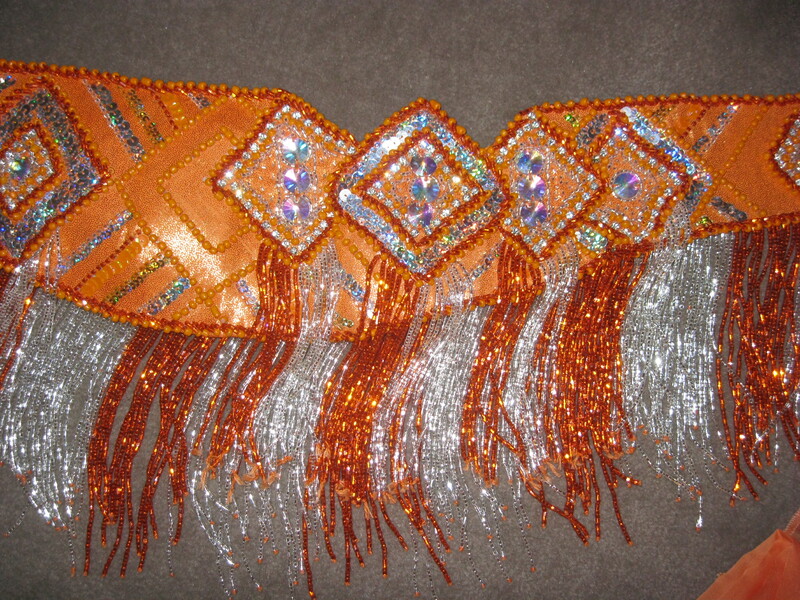 This is a beautiful and sparkly orange and silver Dahab that i received in a trade. I have never danced in it because in the end, I just don’t look good in full skirts. 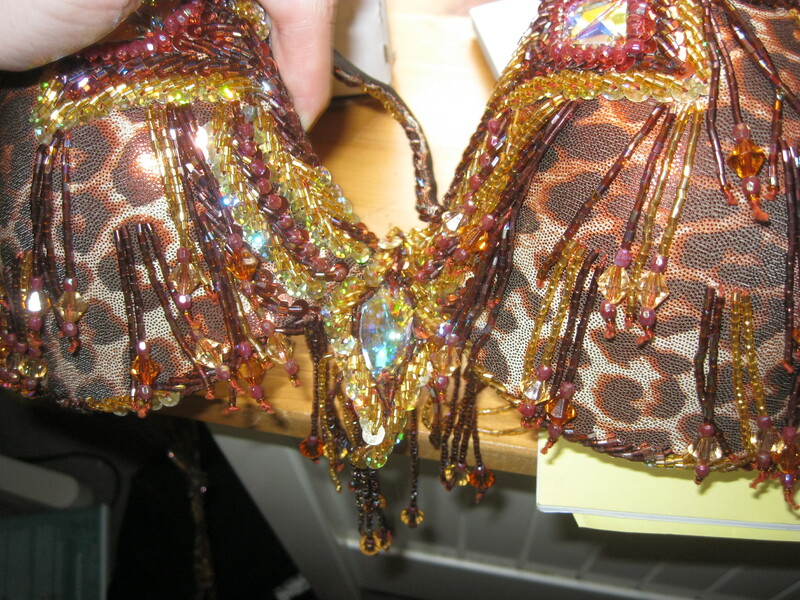 The set has amazing details and a diamond theme that extends from the bra, to the belt, and to the arm and wrist cuffs. 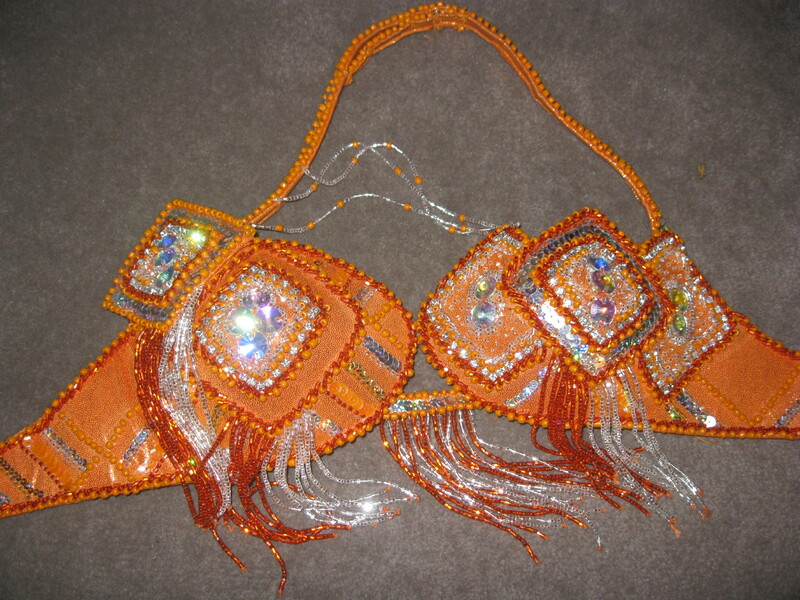 The set includes a bra, belt, two arm cuffs, two wristlets, a chiffon veil, and a chiffon skirt with two slits. 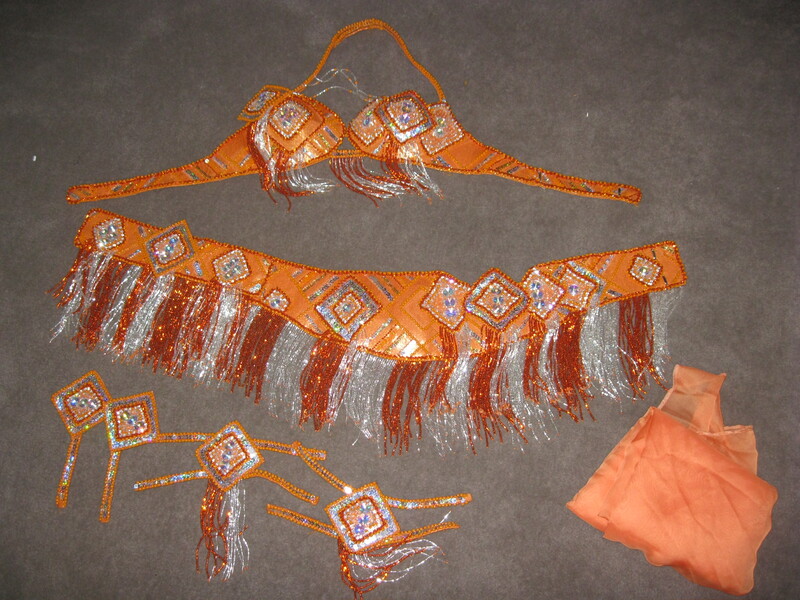 The base material for the bra and belt is a sparkly metallic orange lycra. Fuschia Flowers from Brazil! SOLD! Next up we have a fuschia flower costume from Brazil. I received this in a trade and it is quite uique. The bra has a line of flowers that connect to the belt. 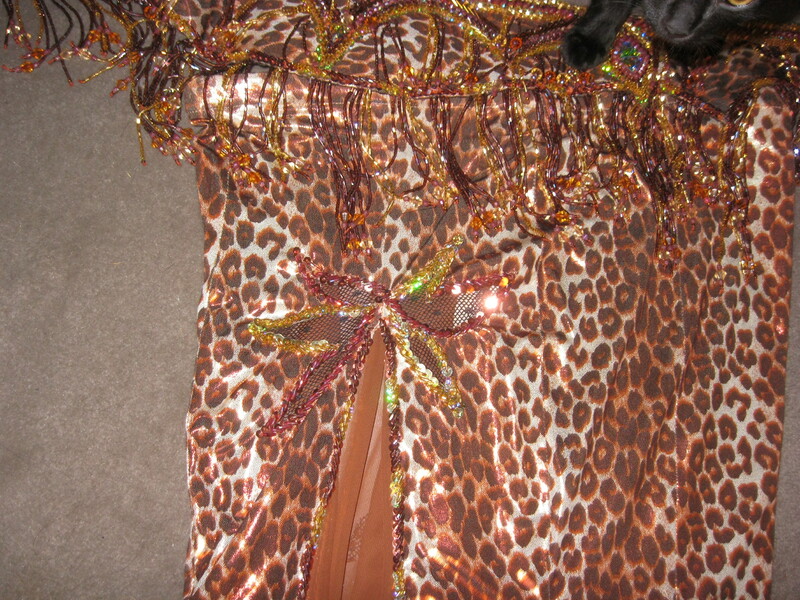 The skirt is super twirly with ruching at the rear and flares out to a full skirt below for super twirling capacity! The skirt has one slit and, I often wore it tucked up. The costume comes with a sheer sleeve that i never sewed on and a replacement sleeve that has not been sewn either. It also has a sheer upper arm cuff with a flower on it. So this one is gorgeous and a real stunner! I’ve loved it but need to rotate! It comes with a bra and belt, separate twirly mermaid skirt with a slit and chiffon insert for modesty. The bra has arm ties that wrap and criss-cross the arm all the way down. It also comes with wristlet and an upper arm cuff. 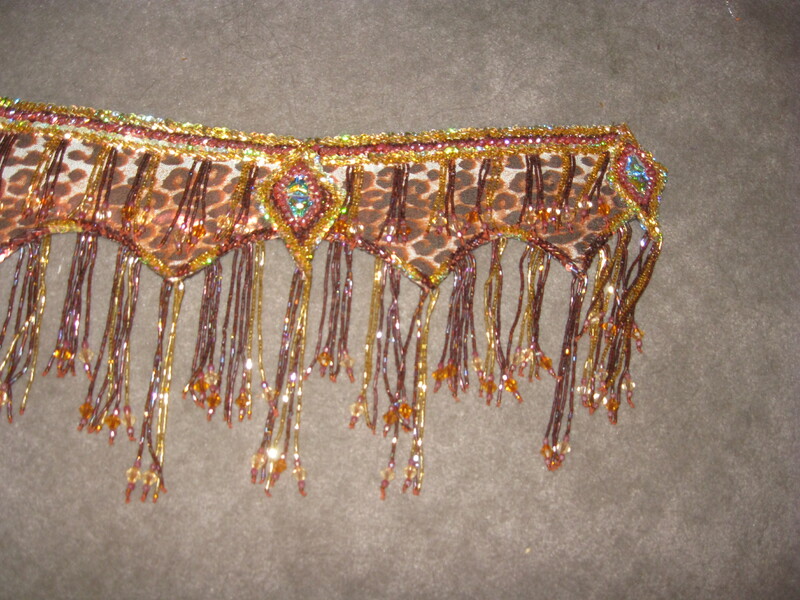 The fabric is a sparkly metallic leopard lycra and the fringe is beautiful and elegantly placed. Bra is 32.5″ underbust and measures on the inside 6″ vertical, 7.5″ horizontal, and 6.5″ on the diagonal. 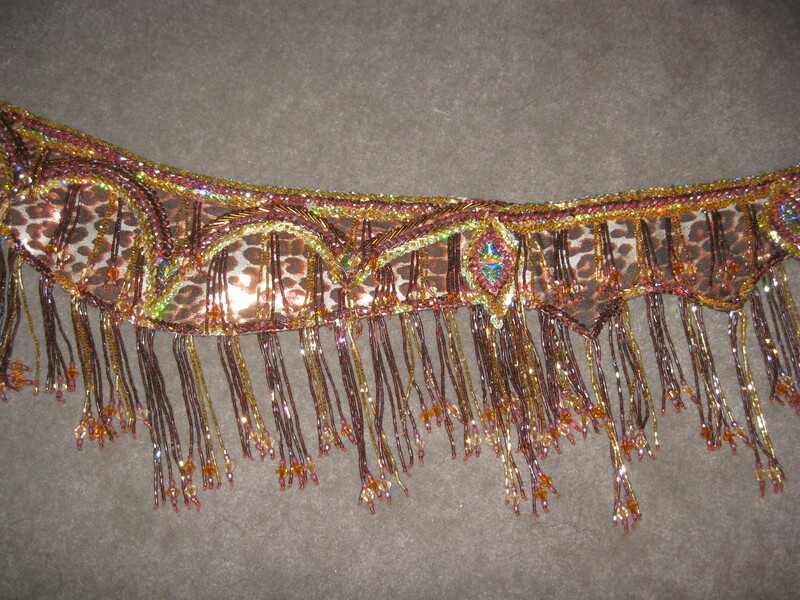 The skirt has the elastic removed at the top and will stretch to 36″ but is currently at a 32″ upper hip. It is 37″ long. Next PostNext To zill or not to zill?